Robotic process automation. Digital technology. Machine learning. Enhanced process automation. Natural language processing. Artificial intelligence. Big data analytics. Cognitive automation. How many different monikers are possible? Could the terminology be any more confusing? Initially, we will steer clear of technical descriptions, which might sound something like: “We are building a cognitive autonomic, data-analytic, neutrally heuristic knowledge engine.” While that may not sound like something you need, it is almost certain that these technical innovations will change how you do business in ways even the pundits are still figuring out. This article puts some of the terminology aside for a moment and describes an evolving field of study we will call “intelligent automation,” which encompasses the more common term “robotic process automation” but includes much, much more. Call it what you want, intelligent automation may not be a choice. It is no longer about “if” but about “where, how, and how fast.” We will provide insights into why intelligent automation is important to the tax profession, your tax department, and business in general. Along the way we will tone down the hype and debunk some of the myths about intelligent automation. In the marketplace, multiple terms, such as RPA and digitalization, have been used to capture the concept of automation of labor by leveraging digital technologies to augment, or automate, the tasks undertaken by workers in your business, including the tax department. This may not sound so new—after all, you have probably been leveraging technology for years to augment your approach to the tax function. In some ways this is still true, but in others, this time things are different. The real power of cognitive computing is its ability to ingest massive amounts of data about which to formulate hypotheses. The human brain cannot handle this volume of data and does not have the time to absorb it, let alone process it. Part of the confusion is that intelligent automation covers a very broad spectrum. On the one hand, intelligent automation is about automating simple tasks, such as cutting and pasting content from one system to another. Imagine sitting in a swivel chair, clicking back and forth among various software programs. You repetitively click through the programs in the same sequence time after time, making countless identical cut-and-paste moves. But now, imagine executing the same routine in far less time, using only one click. On the other (more complex) hand, intelligent automation includes software that thinks and reasons—that is, it provides cognitive solutions. In fact, some advanced intelligent automation solutions can perform activities (e.g., business, medical,1 and legal) previously performed exclusively by humans—and often do it far better than their human predecessors. In this article, we break down this spectrum of automation into three distinct categories to better differentiate among the types of intelligent automation. Tax departments are beginning to understand and apply the great potential of intelligent automation to their core functions. Intelligent automation can support a tax department’s strategy related to the business and many activities that support the tax department’s strategy. A recent poll of over 1,000 professionals in various industries asked, “Do you believe process automation tools will offer value to your tax function?” and found that sixty-eight percent said yes, seven percent said no, and twenty-five percent responded that these tools were “not applicable.”2 So, while more than two-thirds of respondents believe that aspects of intelligent automation will offer value to the tax function, it is interesting to note that this belief is not universal. From a strategic perspective and to simplify these communication challenges, we have divided the spectrum of intelligent automation into three categories: basic process automation, enhanced process automation, and cognitive automation. These categories are not black and white. An automation tool may have the characteristics of multiple categories or straddle the boundary between two categories. This spectrum is not to be confused with a maturity model, as tools in each category have specific capabilities that address specific automation opportunities. In other words, each category addresses real-world issues and provides the appropriate capabilities to solve those specific issues at the right trade-off between cost and performance. In the same way that you don’t want to use a sledgehammer when a regular hammer will suffice, you don’t use a sophisticated cognitive platform to perform basic cut-and-paste activities. Robotic process automation, RPA, bots, process automation, basic process automation, basic robotic process automation—these terms describe essentially the same thing. Confusion often arises from the term “robotic” in robotic process automation; why call such a solution “robotic” if the automation doesn’t use physical robots? The short answer is that “robotic” describes the underlying process, not the automation. In other words, we are automating a process that is naturally robotic, even if humans perform it with manual labor. Such work is done the same way over and over, like copying content from field A and pasting it into field B. When we apply automation technologies to this process—that is, we automate it—we consider that solution a software robot. Basic process automation (or, for simplicity’s sake, a “bot”) leverages a class of technology to automate rudimentary swivel-chair processes found in almost all organizations today. Many tax departments have begun exploring the use of bots to automate repetitive tasks. You may be familiar with creating a macro within Microsoft Excel. That macro typically automates sequential mouse clicks within Excel. By analogy, in its simplest form, a bot is also a macro. However, the bot is a macro that can sit atop multiple software programs rather than be confined within Excel. In this way, bots appear to integrate various software programs. In the past, a computer programmer could always write software code to integrate disparate software programs. However, the newer class of bot software has a user interface where a tax professional can more easily program a bot. As a result, professional software programmers may be unnecessary. The swivel-chair processes subject to basic process automation are typically repetitive, involve multiple systems, and follow very explicit steps, such as when a human captures (cuts) information from one system (e.g., the trial balance from a legacy mainframe system), possibly reformats that data, and then enters (pastes) it into another system (e.g., an Excel spreadsheet). These tools leverage capabilities such as work flows, rules engines, and screen scraping to automate existing manual processes. A particular bot program may reside on the desktop and run at the user level (acting as human users, with system logon credentials like users have), or it may be deployed on a server and accessed by multiple users. As an example, suppose your new tax software requires that you set up a state tax folder for every unique entity. The setup involves selecting (or clicking) the same six options for each folder. You click once to create the folder, click again to select which state you want, then again to indicate that you want all the subfolder options, and so on. Without being augmented with a bot, a tax professional would be required to click 60,000 times just to set up the folders needed to ensure compliance. But with a bot, because the process is standard and repeatable, it can be automated using the bot software, thereby reducing 60,000 clicks to a single click. Once programmed, with a press of a button, the bot will go through all 60,000 steps in a fraction of the time that, and far more precisely than, any human could. In general, these basic automation tools can be thought of as quick-hit technologies that allow for an incremental approach to automation. Bots are another arrow in your quiver for using process and technology to solve a problem. They are best implemented when there are (or can be) high standardization and high volume. Like all tools, they have strengths and weaknesses. Bots should be viewed as a supplement to other technology tools; they may be great tools in specific situations, but may not be the best in others. use “machine learning” (ML) to develop a knowledge base by consuming significant amounts of data to learn and develop a set of algorithms. This set of algorithms is then used to make predictions about data. With these abilities, tools in this category can deal with processes that may involve many complex transactions and require a deeper level of analytics involving both structured data (e.g., a database) and unstructured data (e.g., free-form text). At the same time, these tools can leverage years of experience gained across multiple sets of data, information, and knowledge. As an example, suppose your organization receives numerous Schedule K-1s from different partnerships. While the government-issued Schedule K-1 has prescribed lines on the tax form, often there are white-paper detail attachments (including footnotes) giving further detail with respect to Schedule K-1 items. The government does not prescribe a format for these white-paper details, and each tax return preparer determines how to present the information. Because there is no generally recognized taxonomy, data is typically unstructured and is inconsistently presented by multiple tax preparers, each of whom may use different words to describe the same items. Generally, processing this data requires someone to read and parse each data point on the white-paper detail in each Schedule K-1. However, a combination of natural language processing and machine learning makes it possible to automate the capture, array, and analysis of this unstructured data and transform it into structured data that may be used in a tax application. Hence, the tax filing process using information from the Schedule K-1 and related white-paper details may be expedited, and quality and consistency can be enhanced by reducing the likelihood of manual errors. In general, enhanced process automation tools are more complex and take longer to develop and implement than basic process automation. These tools typically also take longer to integrate into the environment, do not reside on the desktop, and may require connections to the cloud to gain the maximum benefits. Cognitive automation is probably the most confusing and most hyped technology but also holds the greatest potential to revolutionize how you work. Not surprisingly, it also requires the largest investment in time and dollars. What is cognitive automation? Cognitive software mimics human activities such as perceiving, inferring, gathering evidence, hypothesizing, and reasoning. And, like humans, cognitive software is taught rather than traditionally programmed. In other words, while we program explicit steps into a traditional computer to solve a problem, in a cognitive solution, we teach the tool the area of interest, or “domain.” Once the base domain knowledge is established within the software, the cognitive solution typically continues to learn and solve problems within that domain, generally all on its own. A domain may include all or a portion of a federal or state tax law. When cognitive solutions are combined with automation, these systems can be trained to execute judgment-intensive tasks. In years past, when artificial intelligence (AI) systems were constructed, the challenge was making them smart. Expert knowledge bases were built through a very low-tech process of interviewing an expert and then capturing information by manually building a knowledge system using languages designed especially for AI. This representation of knowledge was extremely hard to build and almost impossible to maintain.3 As a result, static knowledge quickly became outdated. With recent advances in natural language processing, computers can now read and extract meaningful information from unstructured data. This capability is, by far, the single biggest driver of what will be the explosion of computer-based cognitive intelligence. Here’s why. As much as eighty percent of the world’s data is unstructured.4 What’s more, ninety percent of this unstructured data has been created since 2011.5 The ability to leverage this data, meaningfully consume it, and build the associated knowledge ontology in an automated fashion changes the promise of this technology. While the tremendous upside of cognitive automation tools is tantalizing, they generally require a much more significant investment in time and resources, including personnel, training, and dollars. The contextual learning stage alone can represent an investment measured in years, not months.6 These are not back-office tools for which you can write a script and fire off an automation program. The role of cognitive automation in the tax profession, and in the business world in general, is still evolving. Recent media demonstrations of cognitive automation—the victory of IBM’s Watson on Jeopardy!, the defeat of a Go master by Google’s AlphaGo’s AI program, a driverless Google car navigating city streets—have catalyzed public excitement and engagement.7 But we are still in the early days of the evolution of these technologies, and much has to be learned, developed, and tested—and these are not inexpensive endeavors. What does intelligent automation mean to the leaders of an enterprise’s tax function? 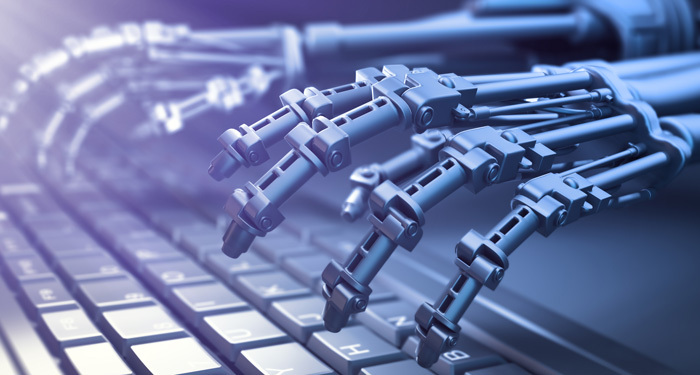 Given the diverse nature of the tool sets and the confluence of technologies available, it is possible that your organization is already using basic process automation (i.e., bots) in some form or fashion. So, where do you begin? With intelligent automation in general, you can start small and move toward more sophisticated tool sets, building upon success. The effort can start in the tax function, or it can be part of a larger enterprise effort. And allowing people to identify areas where your department can use intelligent automation is very empowering. Our observation is that most tax departments will explore basic process automation first. One consideration is that it offers a potential augmentation or alternative to offshore labor arbitrage. (Labor arbitrage is a middle- and back-office strategy that cuts costs by offshoring work to lower-cost countries, such as India, China, the Philippines, etc.) Many tax departments have begun to study what increasing reliance on process automation will look like for their companies. What Happens to Tax Professionals? The hype may have you believing that bots will take over the world. As discussed above, most of the automation, especially in the near term, will likely affect repetitive, mundane tasks, followed by a quick pivot toward natural language processing and machine learning as a way to deal with unstructured data. In many situations, eliminating these tasks will allow tax professionals to increase their engagement with the work and to devote more time for analysis to create value by identifying opportunities and minimizing risk. Of course, this assumes those tax professionals have the skills to perform higher-level analysis. Additionally, more and more tax professionals may evolve into automation/process specialists, although most tax professionals may still have to familiarize themselves with some of the current technology concepts as they become integral to their operations. Over time, it is quite possible that the tax and accounting fields may transform completely (as may entire industries such as auto manufacturing, communications, and transportation services). However, the timing is up for debate. Some experts claim five to ten years; others predict it will take many decades to develop the capabilities of intelligent automation and generate knowledge. But one thing is sure. We are witnessing the beginning of a technological revolution. The case for augmenting tax professionals with intelligent automation is compelling and multifaceted and includes several potential key benefits, as follows. Engaging team members. Eliminating soul-crushing, uninspiring, mundane, and repetitive tasks should allow employees to focus on value-added activities. Allowing team members to identify the areas best suited for intelligent automation may lead to increased job satisfaction and lower attrition. Productivity/performance. Bots are designed to work 24/7, 365 days a year; they don’t have to wake in the middle of the night to start batch processing after the books are closed. Scalability. With the right governance, intelligent automation can scale instantaneously at digital speeds to respond to fluctuating workloads. Consistency/predictability. The programming logics used in bots are designed to eliminate inconsistent decisions, e.g., not electing to turn right one day and left the next if faced with the same scenario. They are configured to solve a problem the same way every time. Quality/reliability. When properly configured, tested, and maintained, bots make no mistakes and thereby eliminate human error. That said, when not properly configured and maintained, a robot will fail—at digital speeds. Auditability. Bots keep a log—a file built by the software that documents every action it took and the corresponding outcome, a file that should, if properly backed up and maintained, provide an audit trail. Intelligent automation will likely change the landscape of your tax function. But, like most technology-based evolutions, it will probably happen in increments. The potential benefits summarized above support the primary objectives of the tax department’s strategy to support the business (e.g., support after-tax business decisions and manage regulatory compliance and risks effectively and efficiently). In fact, intelligent automation presents an opportunity for the tax department to significantly enhance value in many areas. This article covers a lot of ground on the broad spectrum of intelligent automation. We have discussed the different capabilities and applicability of the various categories of intelligent automation. Our goal is to enable a more meaningful conversation about the inevitability and potential of intelligent automation, especially as tax departments begin to enter this arena. These are exciting times, with great opportunities right around the corner. Intelligent automation will likely change the landscape of your tax function. But, like most technology-based evolutions, it will probably happen in increments. And there is a good chance it will happen in ways that are likely to surprise you. Be prepared to say at some point, “How did we get here, and when did all of this happen?” As tax professionals, you have to decide if you will embrace this technology, understand it, get ahead of it, and be an early adopter. Editor’s Note: The information contained here is general and is not intended to address the specific circumstances of any particular individual or entity. This article represents the views of the authors and does not necessarily represent the views or professional advice of KPMG. Steven K. Rainey, KPMG partner, is chief innovation officer and national data and analytics leader, tax. Brad Brown, KPMG partner, is chief innovation officer and national transformation and technology leader, tax. David B. Kirk, Ph.D., is KPMG managing director, advisory. Ariana Eunjung Cha, “Watson’s Next Feat? Taking on Cancer,” Washington Post (June 27, 2015), www.washingtonpost.com/sf/national/2015/06/27/watsons-next-feat-taking-on-cancer/?utm_term=.3f10c8c9733b. Marc T. Macaulay, Brad L. Brown, and Steven K. Rainey, “Emerging Developments in Tax Reporting and Financial Analysis: The Impact of the Latest Technologies Including D&A and Digital Labor,” KPMG Financial Reporting Network (December 1, 2016), www.kpmg-institutes.com/institutes/financial-reporting-network/events/2016/12/part-4-emerging-developments-in-tax-reporting-and-financial-analysis.html. SINTEF, “Big Data, for Better or Worse: 90% of World’s Data Generated Over Last Two Years,” Science Daily (May 22, 2013), www.sciencedaily.com/releases/2013/05/130522085217.htm. Lauren F. Friedman (Reuters), “IBM’s Watson Computer Can Now Do in a Matter of Minutes What Takes Cancer Doctors Weeks to Perform,” Business Insider (May 5, 2015), www.businessinsider.com/r-ibms-watson-to-guide-cancer-therapies-at-14-centers-2015-5. Nello Cristianini, “The Road to Artificial Intelligence: A Case of Data Over Theory,” New Scientist (October 26, 2016), www.newscientist.com/article/mg23230971-200-the-irresistible-rise-of-artificial-intelligence/.